Constellation Records and the Double Negative Collective are presenting a free outdoor screening / live music performance in the parking lot of the Constellation Records office this Sunday, August 29th, 2010. 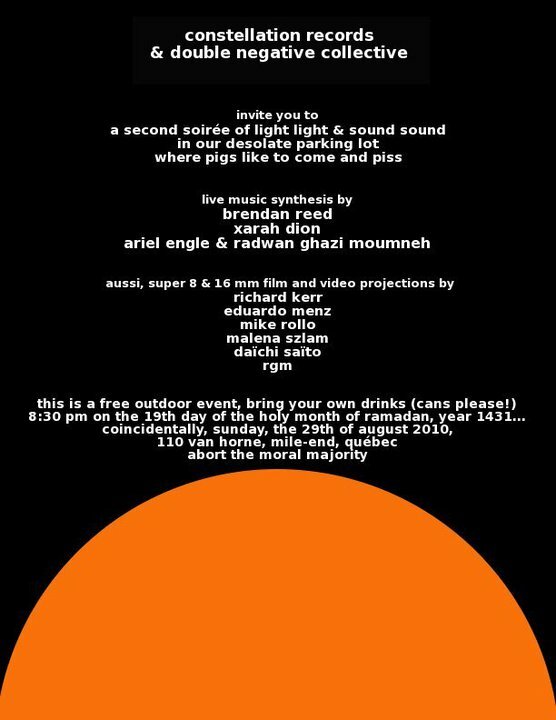 There will be live performances by Brendan Reed, Xarah Dion, Ariel Engle and Radwan Ghazi Moumneh and projected films and videos by Richard Kerr, Eduardo Menz, Mike Rollo, Malena Szlam, Daichi Saito, and Radwan Ghazi Moumneh. The event is free and the screening starts at 20H30. The address is 110 Van Horne, Montreal, Quebec.